We are David and Sheri Burns, sharing various aspects of our beekeeping business with you, like these online beekeeping lessons. So many people just drive out to our farm and visit, and many others call and ask questions. Many more email us. We are always happy to visit and to help others start keeping honeybees! You can click on some of these pictures for a large size image. Honey! Honey! Honey! This is why many people keep bees, to enjoy the honey. Winnie the Pooh said, "That buzzing-noise means something. If there's a buzzing noise, somebody's making a buzzing-noise, and the only reason for making a buzzing-noise that I know of is because you're a bee. .... And the only reason for being a bee that I know of is making honey....."
I'm asked all the time about honey! People ask me how the bees make it, how much honey can a hive produce and why honey can be a different color and have different tastes. Here's the deal. Winnie was right...the only reason for being a bee is to make honey! Oh they do other things, but a beehive in general makes honey. It makes honey for its own existence. A hive stores honey for the present and for the future. Since bees are workers, they will store more honey than they need...lots more. This is the honey that we as beekeepers remove from the hive--the excess honey that they can spare. After a couple of weeks of duties inside the hive, the female worker bee is recruited to begin foraging for nectar. We call her a forager. She waits until the first sign of daylight, then off she goes making many trips back and forth from the hive to the flower until it gets dark. The nectar that she is gathering from flowers is high in water content. Nectar becomes honey once the bees bring it back to the hive and reduce the water content. When the foraging bee arrives at the hive, she often transfers her nectar load to another bee, called a house bee. A house bee is just a regular bee with household duties, but she too will one day earn her wings to gather nectar. The house bee will then transport the nectar to a cell where it will be placed so it can ripen. Once the moisture level of nectar is reduced to 17% then it is called honey, and the bees will seal off each cell with a cap of wax. This is how we know the honey is complete and ready for harvest...the bees seal it off. How do they reduce the moisture of the nectar? They fan their wings over the comb to dry out the moisture from the nectar. How do they know when it reaches 17%? I have no clue. I suppose they have a quality control bee that has the sole job of taste sampling the honey. What makes honey different colors and gives it a different taste? The nectar source. My favorite honey is orange blossom honey. When I was in Israel in 2006, I bought some orange blossom honey and fell in love with it. I grew up on clover honey and I thought all honey tasted pretty much the same. But there is a big difference. Here in Illinois, we have Spring honey and Fall honey. Spring honey is light in color and taste because our nectar source in the Spring is from flowers that produce light nectar, such as clover and locust trees. However, in the summer and early fall, our nectar source is darker and more robust in flavor as it comes from aster, golden rod and other summer and fall flowers. An expensive and more difficult honey to produce is Tupelo honey, from the Tupelo tree, mainly found in Florida. There are many types of honey, from every nectar source you can image. This provides many different types of honey with different tastes and a different color. 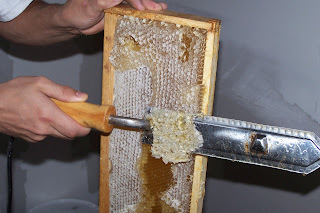 Not only is there liquid honey, but there is also comb honey-honey that is sold still sealed in the beeswax comb. We have lots of customers who love comb honey. They love it so much we always sell out of comb honey early in the year. Okay, so how does a beekeeper get honey from the hive into the bottle? Good question. Here's the simple way we do it. First, when the honey is ready, we head out to our bee yards to essentially steal all the extra honey the bees have made. We are able to drive our truck near the hives, and in the back of the truck are two important items. A generator and a 15 gallon air compressor. The air compressor is powered by the gas generator. We then stand a honey super on edge and with the air compressor we gently spray off all the bees. Then, we place the honey supers in the truck and drive them back to our honey room. Once in the room, the individual frames are loaded into our automatic cowen uncapper which uncaps the sealed combs. Then, it is placed into our 33 frame extractor which spins at a high rate of speed, slinging the honey out of the comb. The honey then flows into a settling tank so that wax and other objects float to the top. A honey pump carries the honey from the bottom of the settling tank up to our 500 gallon holding tank. To fill jars, we open up a value on the holding tank and the honey runs through micron filters. Normally we only run it through one 400 micron filter. Sometimes we use 200 micron filters. Then, the honey is bottled after being filtered. We never heat our honey. Honey never spoils and is the only food that has an indefinite shelf life. Most honey will become hard, known as crystallizing. This is normal and does not mean the honey is bad. It means it simply crystallized. This can be remedied simply by leaving a jar in warm water for a while. If you are new to beekeeping, I recommend you start off processing your honey with one of our new hot knifes, that cuts the cappings off, opening up the comb so the honey can be drawn out. Then, it is best to use an extractor. You don't have to. You can let it drain out or press it out, but if you can afford to invest in a new hand crank extractor, it will make the job much easier. We also sell micron filters that fit over a regular 5 gallon jug so that you can easily filter your honey, making a very nice product! Then, it's off to the stand to sell your honey! I love getting out, selling the honey and meeting great people. Everyone always has great questions and are intrigued by bees. You'll love selling your honey too! Well it has been good to be with you again, and I look forward to sharing the next lesson with you in the next few days. A big thanks I think? I have fell off the fence built a hive and am getting some pollen and a feeder from your store. I have read everthing about 200 times and you know how it is no matter how many things you learn your just feel stupid as dirt when things go bad. I will not have any problems I am a natural and my hives will be world renouned OK I am cracking jokes to say the least I am excited to be jumping in. I do have one question I can not remember reading about and that is why is a mix of sugar water used to feed new bee's upon arrival spraying with sugar water is a great idea and plan on using it but why use sugar water and not honey? Well here it is April 7th after waiting months for everything to come together. I have everything installed and running. I got so excited when the Bee's showed up I grabbed my surgar spray and feeders loaded everything up and forgot to put on my safety gear. DOH! No problem seems the Bee's were as glad to get out of that nuc as I was to see them show up. I ended up getting my Bee's here in California from Bee hive genitic's because I figured it was much closer to home and less stress on the Bee's. I will continue to buy all of my supply's from your store. I am very pleased with everything so far. I feel like a new daddy! Should I be handing out Cigars? I wanted to know if you knew of a really cheap bee extractor (preferably under $100). I am getting into beekeeping but I don't have much of a budget. Any advice would be appreciated. Hello, I'm doing an essay on animal products in North Dakota and I'm having trouble finding the information I need. I know it's a long shot you will know the answers to all of my questions or that you'll even answer me, but I need to try. How much honey is produced in North Dakota annually? How much does one honey beehive produce? How many bees are in the average hive? How much money does North Dakota make annually from honey? If there's anything else you could tell me that'd be great!